To understand what a movement in price actually reflects, you have to know market percentages. Matthew explains an important concept in simple terms. Your teachers weren’t lying, there are actually a few interesting uses for maths. Gambling (as opposed to the form study side of things) is all maths. Which means if you are to be a successful gambler, one of the most important things you can get your head around are the market percentages. The total market percentage here is obviously 100%, that is the sum of all the chances in the race. 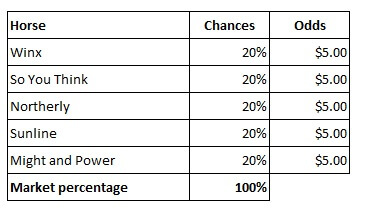 To convert the percentage to odds, just divide the percentage into 1. 1 / 20% = $5. If the market behaves perfectly, then the bookie takes an equal amount of money on each chance. In our example above, they’d take (for example) $1,000 on each of the five chances, for a total hold of $5,000. Whichever horse wins, they’ll pay out $1,000 of bets at odds of $5: a payout of $5,000. Simple. The obvious issue there? The bookie makes no money! $5,000 in, $5,000 out. You’ll see that mathematically, the increases in percentage decrease the odds. The bookie gets more, the punter gets less when they win. Odds are also rounded up – usually to the nearest increment of $0.10 – so that decreases odds further. That’s a crucial thing to remember: the higher the total market percentage is on any market, the lower the odds and the harder it is – in a purely mathematical sense – to beat the market and make money. Whilst in our market the total percentage is 110%, many fixed odds racing markets (close to race time) can operate at between 115% and 125%. Pre-post and futures markets are even higher: sometimes up toward 200% or greater. Here you see the impact on a punter’s betting. The real chances of any of the horses is 20%, or odds of $5.00. But if his market is accurate, he can keep backing the horses at $5.00 and he won’t make money. By decreasing the total market percentage to 90%, when he is punting he now needs an overlay on his price of $5.56. If he only bets when he gets the $5.56 or greater, he’s built a profit margin into his betting. Nothing changes with the horse: it’s real chances stay the same. But his punting changes to only place a wager when he can get a price which offers greater than his own price of $5.56. The margin becomes even greater when you consider he doesn’t have to just beat the 100% market, but the bookie’s market, which is 110% in this example. 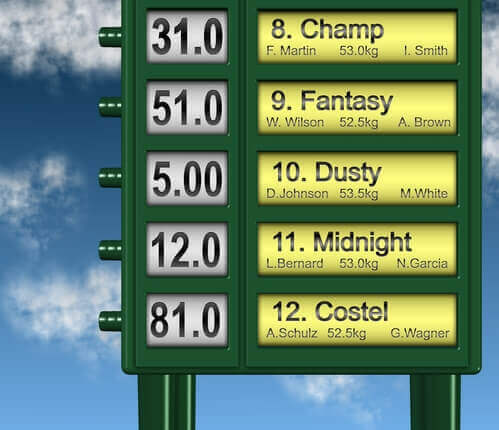 I had a look at how Champion Bets Melbourne ratings analyst Trevor Lawson does his market, and he uses a 90% market which is then adjusted for rounding off his prices, which generally ends with the market at between 90% and 94%. One of the things that understanding market percentages allows is you to see what a movement in price actually reflects. It’s one thing many punters don’t understand. Take for example, and even money shot ($2.00 in decimal odds), which in the 100% market is a 50% chance of winning. Compare that to a $8.00 shot, which in the same market is a 12.5% chance of winning. Winding both in by $0.50 may seem like a similar move to the uneducated punter, but in fact it’s an enormous difference. But while a $8.00 has a 12.5% chance, a $7.50 chance has a 13.3% chance: a move of only 0.8%. Both $0.50 moves in price, but hugely different in terms of real chances. What this tells you is that when betting, you can accept less of an overlay on short-priced chances, as in percentage terms it can still be a large advantage. A $0.50 overlay is huge at $1.50, whereas at $8.00… or $10… or$100… it’s much less. For this reason, when adjusting the market down to a lower overall percentage (such as the 90% in our example), a short-priced chance will have its price shortened by less in $ terms compared to huge $ movements in long shots. They might appear huge moves… but it’s all about the percentages! Hopefully this article on market percentages in betting makes sense! We’ll follow up with some further principles next time. In the meantime, feel free to pose any questions in the comments section or contact the Champion Bets team. They know what they’re doing and will be able to help!